Life is getting short and we are in rush ! The reason is we don’t generally have much time. As we are getting more and more busy, this has influenced our life completely. Not only we have got a habit of taking short-cuts in real life but also the usage of short-form of words can be seen anywhere. Even while chatting with friends on Facebook, Twitter, WhatsApp etc. we prefer to use handy abbreviations. 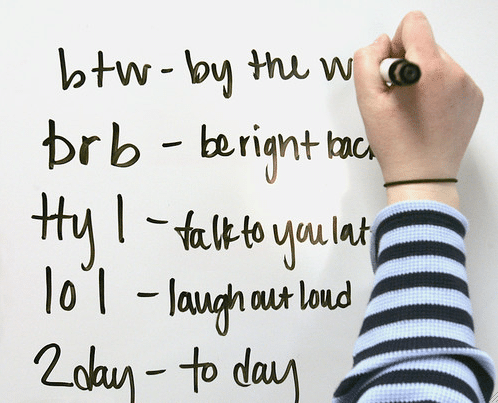 Using such quick abbreviations help us save time from typing longer while chatting. That is why you may notice use of the terms like LOL, WTF, BRB, ROFL, AKA, PS, PPS etc. a so many times on social medias these days. But ever wondered what does WTF mean ? What is the meaning of BRB ? Why Your friends use LOL, ROFL etc. ? The fact is that – if you don’t know the meaning of these chatting short-cuts, you may certainly ask your friends that what does it mean, but asking the meaning of such popular chatting abbreviation may be awkward situation. So we have compiled a list of all commonly used popular Facebook, Twitter, WhatsApp etc. chatting abbreviations with their meaning. Aight meaning– Are you alright ? AYSOS meaning– Are You Stupid Or Something? CTS meaning– Changing The Subject ? GTH meaning– Go To Hail ! OMG meaning– Oh my God!, Oh my Goodness! WDUWTA? meaning– What do you want to talk about ? WTH? meaning– What the hell? The services like Twitter and short text messaging service (SMS) etc. allow you to express your message or words withing 140 -160 characters only. Using these handy Facebook, Twitter, WhatApp etc. Abbreviations ensures that you may express your messages easily withing the word limits. Did I miss any of the meaning ? Do let me know what abbreviations you most commonly use while chatting with your friends ! If you liked it, share your views in the comment box below. Find Snapchat Friends : How to Find Friends on Snapchat ?